The ARLIZI rose gold plated jewelry collection offers a wide choice of unique design with a contemporary look. The jewelry is made with care and is excellent value for money; the base material is sterling silver, this is the highest quality silver, plated with a base and upper layer. This keeps the rose gold jewelry colour beautiful for a long time. 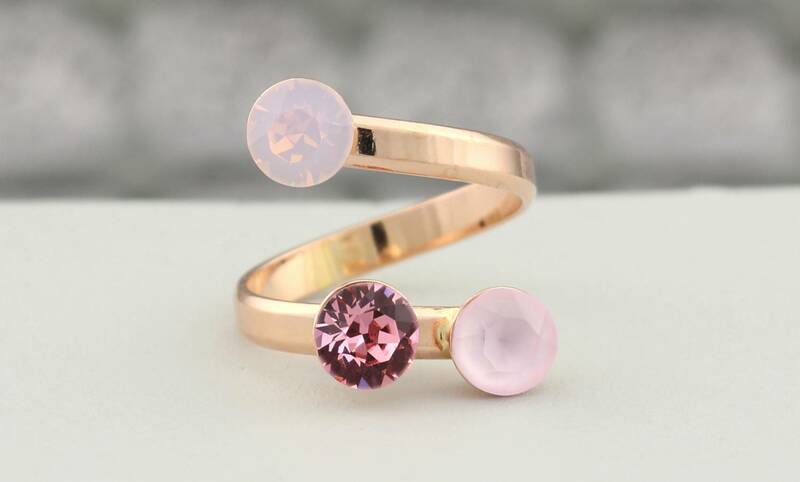 Rose gold jewelry flatters everyone, it gives a warm pink glow and is beautiful to combine with the new trend colours; all shades of grey, very chic in combination with dark blue and with soft pink and blush shades. Do not hesitate to mix rose gold jewelry with silver jewelry, these two colours work very well together, and when you work with layers you get a hip effect. In our extensive collection you will find unique rose gold ring earrings, necklaces, bracelets and design rings, often combined with Swarovski crystal in complimenting or contrasting colours. Our pearls are also finished with rose gold plated jewelry parts, in short, many choices of styles for different looks and occasions.